Karen Burns-Booth shows us a simplified Spanish orange custard flan. These colourful little desserts are ideal for dinner party cooking! One of my favourite desserts is the Spanish “Flan de Naranja”, which you can buy all over Spain, in bars and restaurants, as well as on market stalls, it’s truly Spain’s national dessert. They are usually served with a caramel topping, like a crème caramel in France, but my recipe for Spanish Orange Custard Flans today has been simplified to exclude the caramel and has fragrant orange blossom water added for an exotic flavour. As well as being made and sold in Spain, some of my friends from the States told me that these little orange flans are very popular in Mexico too, although I have yet to taste one “in situ” yet! 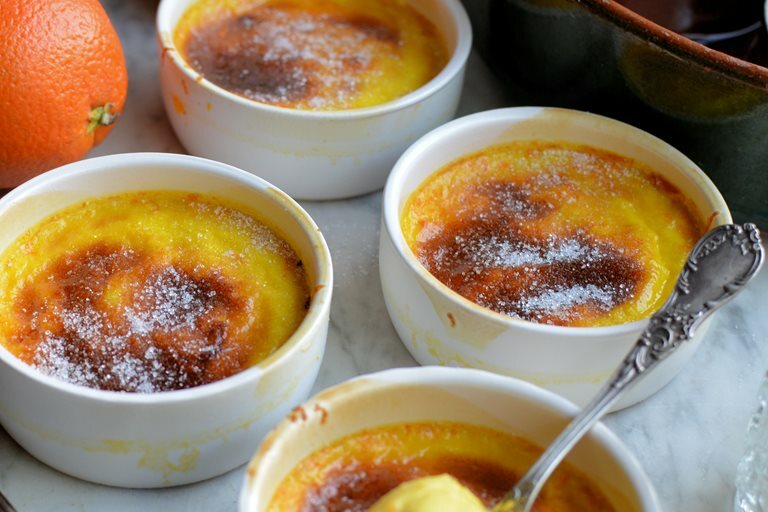 You can adjust the flavourings, instead of orange blossom water, you can add a good swig of orange liqueur for adult dining and a dinner party dessert, and, vanilla extract also works well in these custard flans. Beat the eggs in a large bowl or jug that has a lip. Add the milk and sugar to the eggs and whisk together. Add the orange zest and orange flower water and mix well.